I love to explore needlework as it relates to other arts. As well as needlework I like to bead, crochet and rug hook. I find the public library is a wonderful resource to browse through books and find inspiration. I picked up a book called “Amigurumi” by Lan-anh Bui and Josephine Wan. 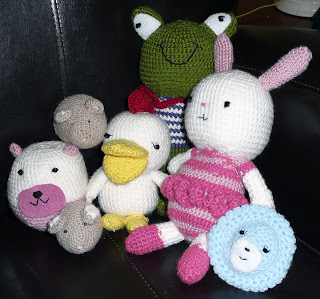 After admiring the cute stuffed animals I read that the word Amigurumi is derived from the Japanese word ami, meaning crocheted or knitted and nuigurumi, meaning stuffed doll. I decided to give it a try. Well, it was fun watching a creature emerge. So far I’ve completed two mini mice, an egg bear, a cupcake bear, a chirpy chick, a friendly frog and finally a ballerina bunny. It’s been so much fun!! As I return to my stitching guild I’ll be bringing a Volunteer Sign-up Sheet for the CreativFestival. The CreativFestival Fall Show is held at the Metro Toronto Convention Centre, South Building , 222 Bremner Blvd. If you think you might be in Toronto October 21st to 23rd and are interested in volunteering at our EAC booth please email me at communications@eac.ca. It’s a great opportunity to get free admission to the show and to socialize with eager to learn stitchers. Don’t forget our National Stitch in public day is September 27th. Plan to proudly do some stitching. It would be great if the weather cooperates and we can sit outside but regardless we’ll have fun.